SrinSoft has expertise of delivering LOD for different levels. We adopt internationally accepted standard for LOD. These development models are purpose built for various stages of design, 3D visualization, construction-caliber quantities, scheduling, estimations, on-site production control and fabrication. The first step is to analyze the current capabilities of your project or organization, which should include technology, processes and people. 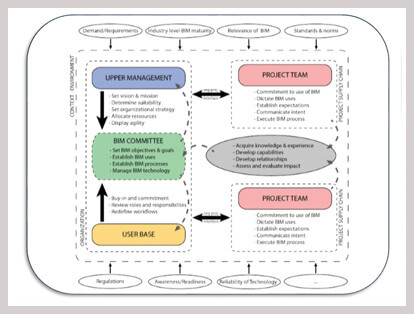 An in-depth analysis of each of the fields to be able to define the current level of BIM maturity. 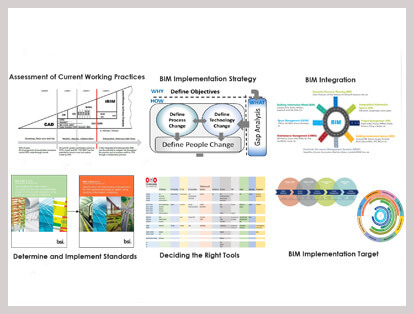 The result of this stage is to create a defined starting point for further BIM adoption. Each organization has an ultimate ambition, a long-term goal when it comes to adopting BIM. Based on the ultimate ambition, intermediate BIM goals need to be defined together with measurable progress indicators and a targeted milestone. It is important to set achievable goals and milestones, to avoidÂ discouragement taking over a successful adoption. After defining your current situation and milestones it is time to identify the steps that need to be taken to reach the goals. The measurements can be broken down in technology, process and people. One can choose parallel adoption, single project adoption or implementation across the board. It all depends on the situation what will work best. Once a certain level of comfort is reached, the capabilities can be assessed once again by returning to Stage 1. 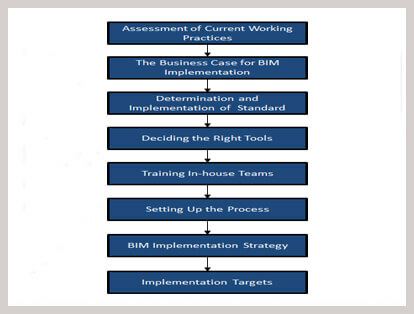 The 4-Stage Implementation Strategy as described above is a generic, simplified process to implement Building Information Modelling successfully. It requires more that purchasing the software and training. As BIM is a non-traditional, non-linear approach, frustration and adverse behaviour are quickly expressed, when implementation by trail-and error. A planned and customized implementation strategy is a must and the only way to climb the maturity ladder of Building Information Modelling.